This post is sponsored by Overstock. All opinions and product choices are my own. 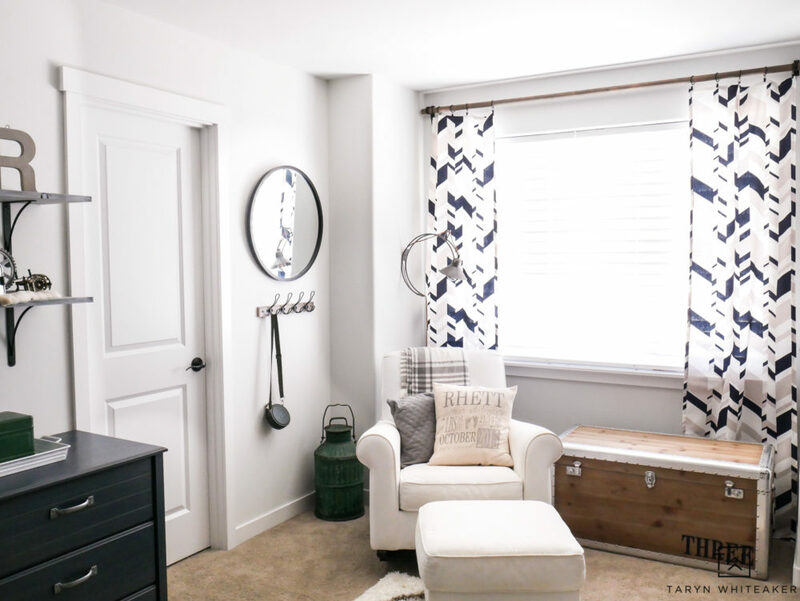 You guys, I have been SO excited to share this room makeover with you all! Almost two years ago I revealed my son’s nursery with you all. Back in October we transitioned his bed into a toddler bed and that did not go over well. Since then, he has slept on the floor next to his bed and wouldn’t budge. 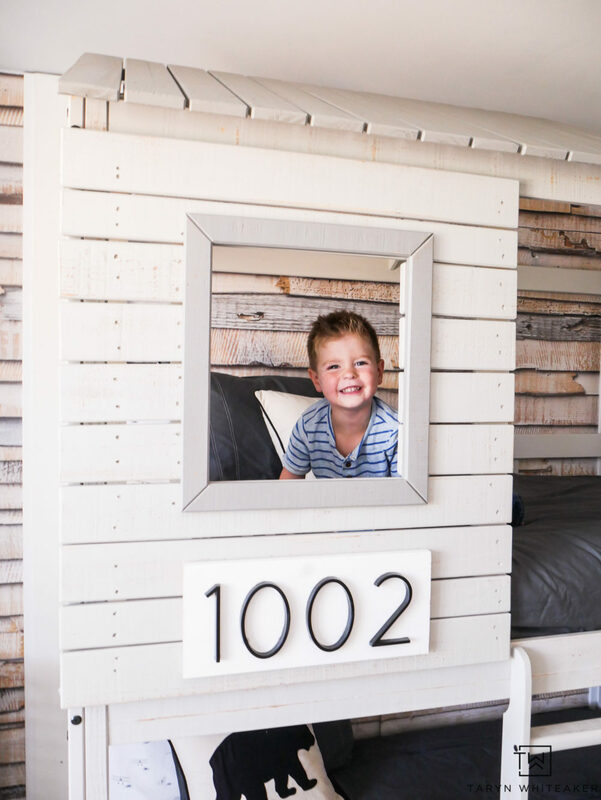 So I decided it was time to give him his own big boy room in hopes that he would actually sleep in his bed and feel like a big kid like his siblings and it turned out amazing (at least he thinks so!). 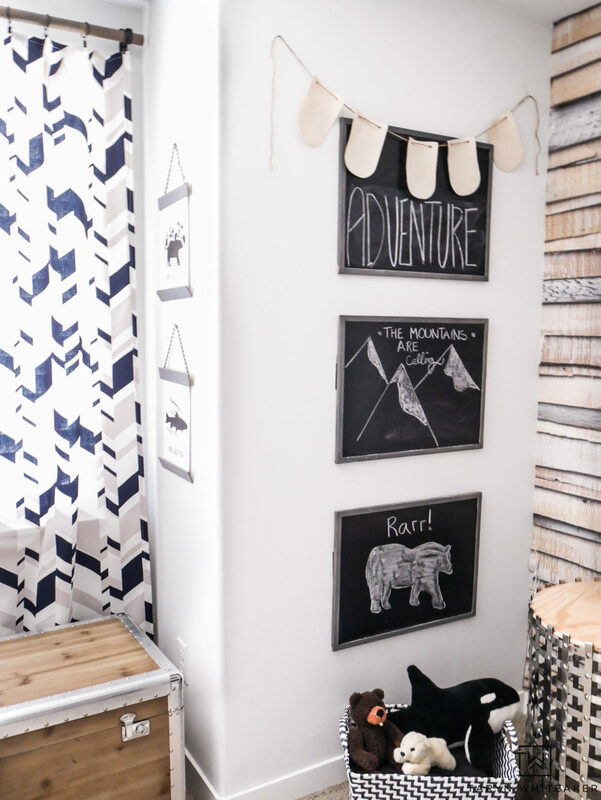 Are you ready, because here is his new Modern Adventure Boys Room! 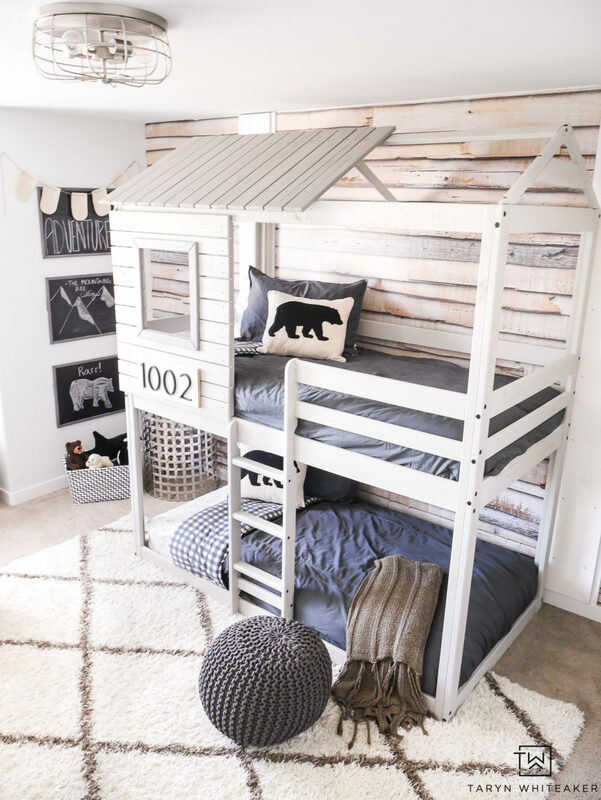 I found this amazing Tree House Bunkbed on Overstock and knew it was perfect for this space! I still love the wood wallpaper from the nursery so I focused the new design around it. 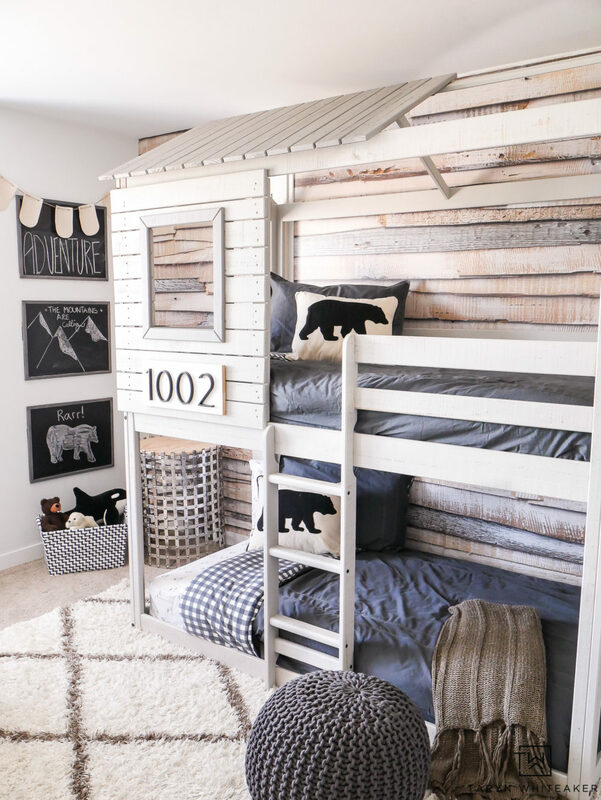 I wanted this room to still have a fun rustic woodland theme with a modern twist. The previous nursery had a subtle vintage fishing theme to it. 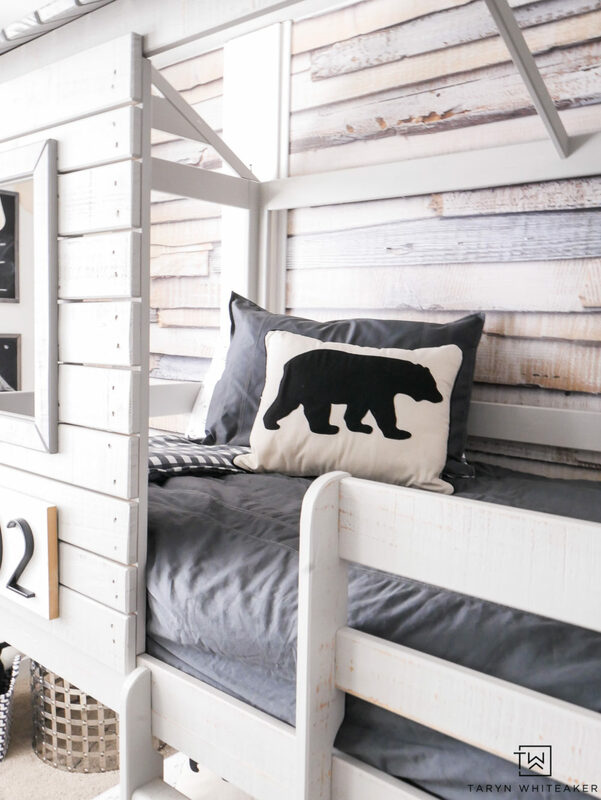 I was able to use a lot of family heirlooms in the decor so I decided to continue the same outdoor theme and expand it into a modern adventure boys room. 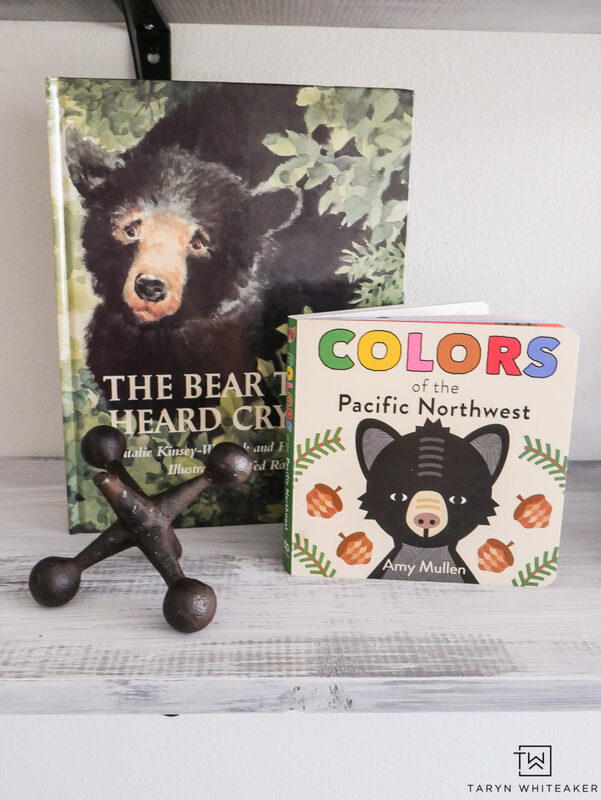 This time adding more mountain decor and black bears. 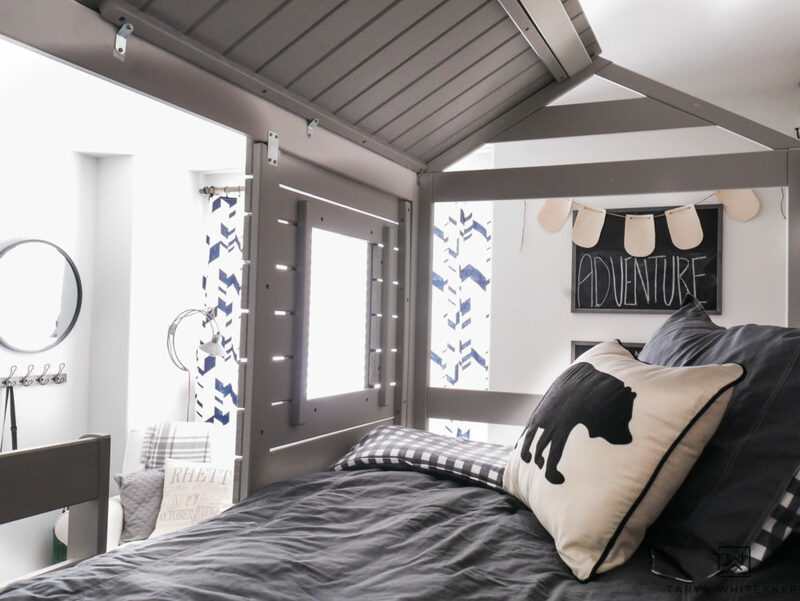 This loft style bunkbed was the perfect solution for us. 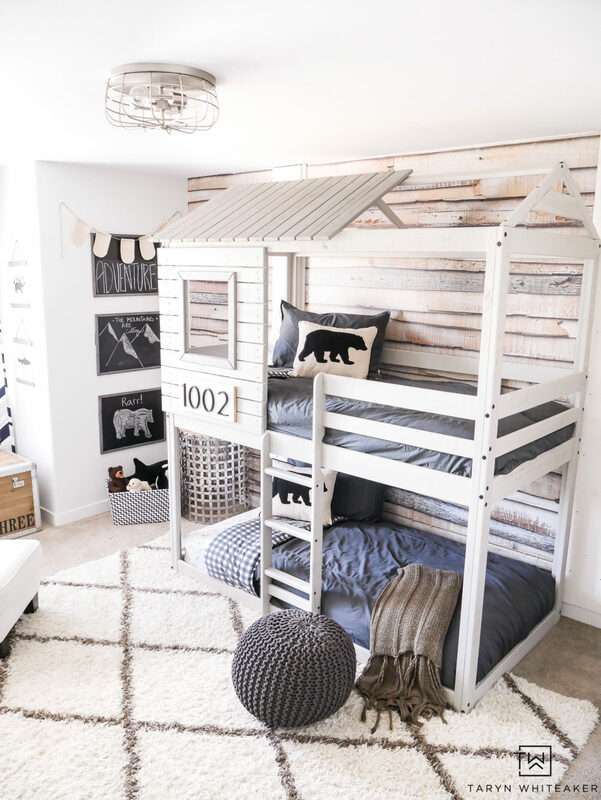 It’s unique, the tree house style looks amazing in our existing space, we now have a bunkbed for the boys to use so we can turn my middle son’s room into a guest room if we ever need to, and it serves as an indoor playground during rainy days! We had the bunkbed set up for a mere hour before the kids had completely transformed it into a ginormous fort that they played in all day. I’ll take it! 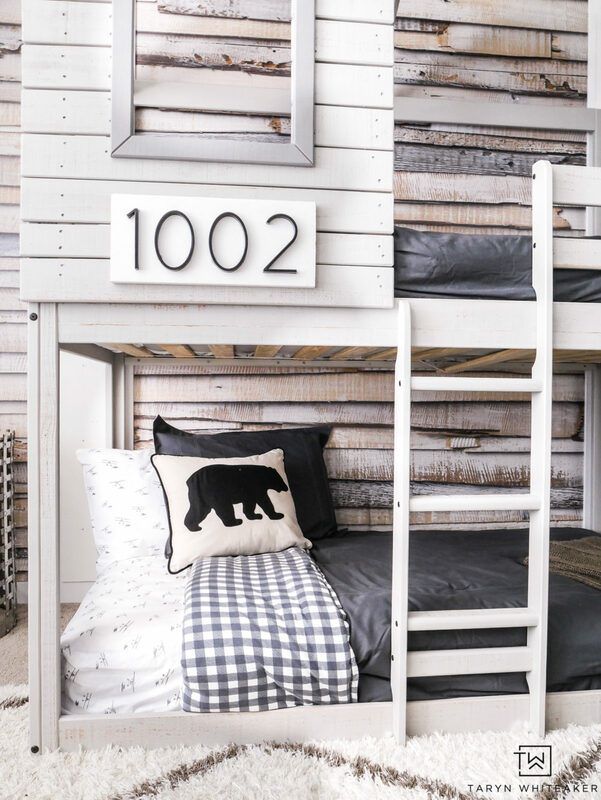 I think this bunkbed is really reasonable, especially given the ‘cool factor’. It took my husband and I about 3-4 hours to assemble it. However, the kids also interrupted us about 5,000 times during that, so it would probably be a lot faster for you :). I give this company 5 stars for the assembly directions, everything was perfectly labeled and made for a really easy build. Let’s talk about the height of the bed for a sec so you know what you are getting into. We have 8 ft ceilings upstairs so this bed worked perfect with our taller ceilings. Now, if you have 7 ft ceilings, it’s going to be a bit of a tight fit. Just wanted to give you a little warning. I love the finish on this bed. In the pictures online, it looked like it was going to be more of a medium gray, but it’s actually a really light gray with a cream white wash on it. I was surprised by how light it was in person, but I honestly love it show much and the color looks great against the wallpaper. The roof and the window trim are a little darker for contrast which is cute. 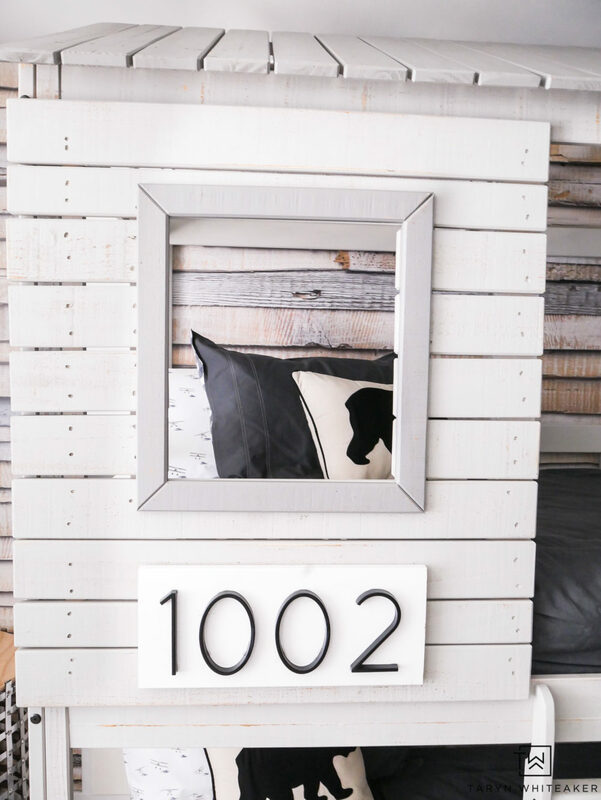 I love finding ways to add a little personalization to my spaces. So I added house numbers to the tree house and used my son’s birthday for the numbers. 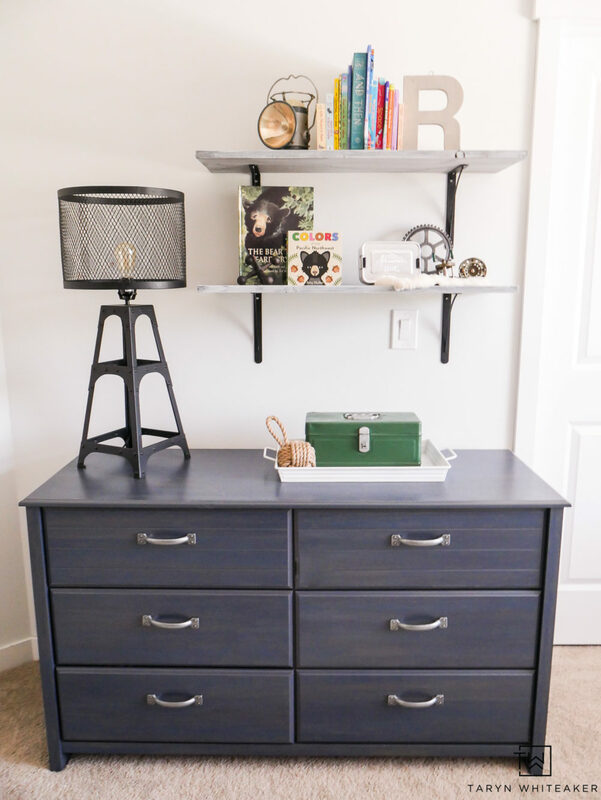 The room was very neutral before and I wanted to give it a little more dimension by adding a darker gray to the space along with some pops of navy and kelly green. 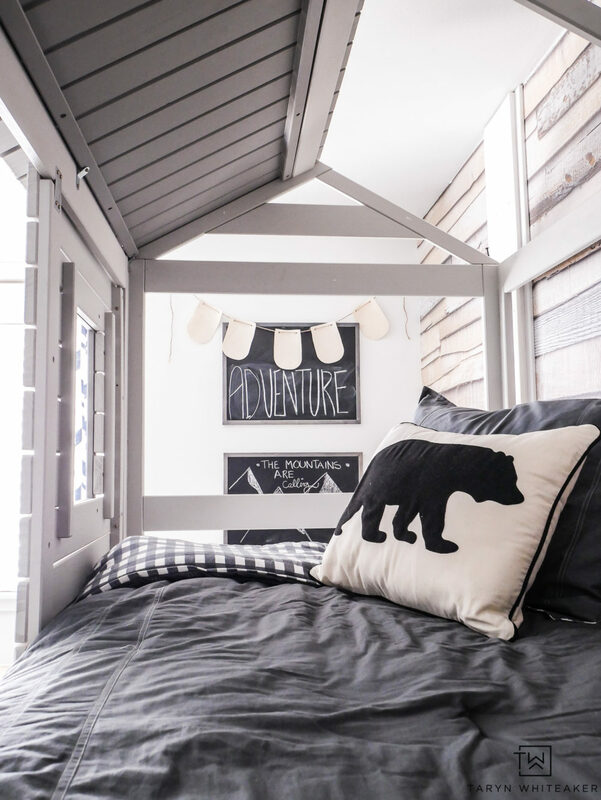 I picked this adorable Eddie Bauer bedding for the bunkbeds! This is the dark gray, but it also comes in a navy as well. It’s double sided with a white and gray flannel, it’s seriously so perfect for in here. 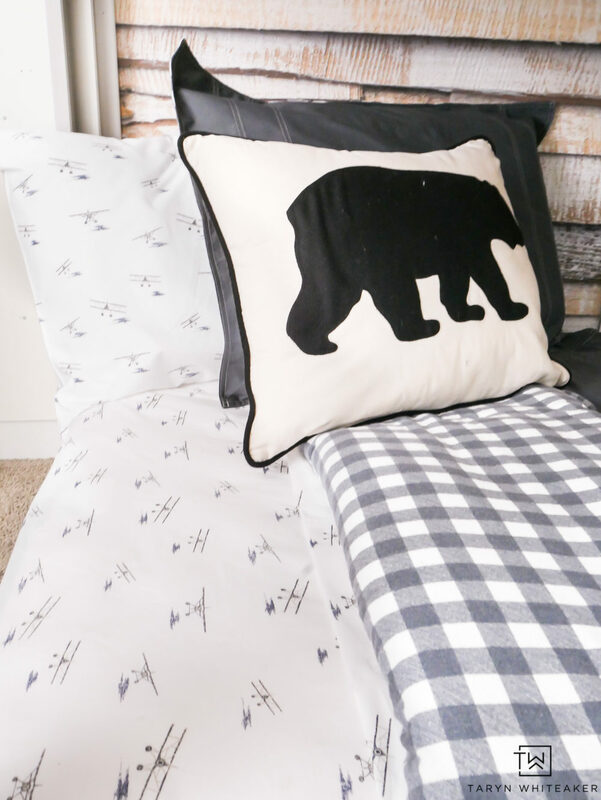 I paired the bedding with these Eddie Bauer sea plane sheets and adorable black bear accent pillows. The whole look come together just how I envisioned it and I couldn’t be happier. My son loves counting all the planes before he goes to bed. With a new bed, we also needed new mattresses! 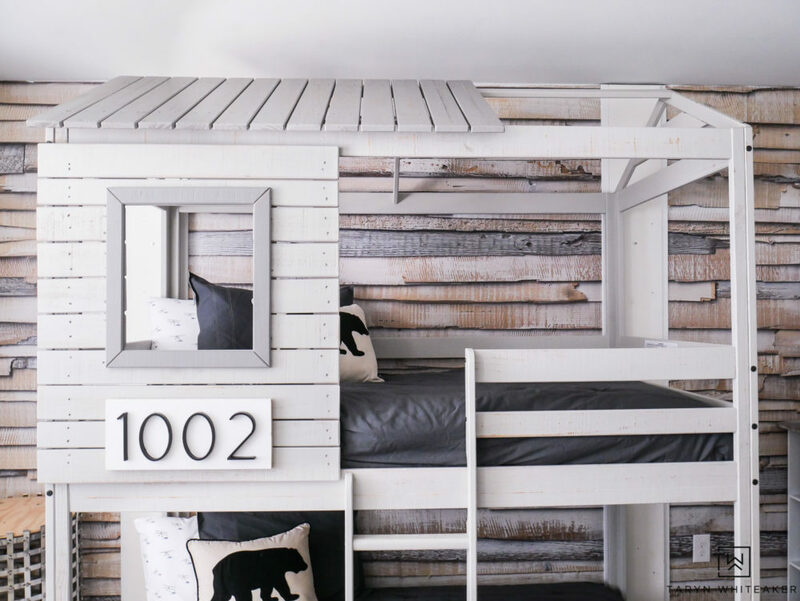 We picked out a set of two twin BeautySleep Firm Mattresses to complete the bunkbeds. They are extremely comfortable. Between reading at bedtime and laying with my little guy in here, I’ve spent a fair share of time in here and I give them a thumbs up! Let’s take a look around the rest of the room. This little window area is a great space for a reading corner. I kept the rocking chair in here because we still use it, but down the road I would like to have a built-in window bench! I have ALWAYS wanted one in my home and this seems like the perfect space for it. 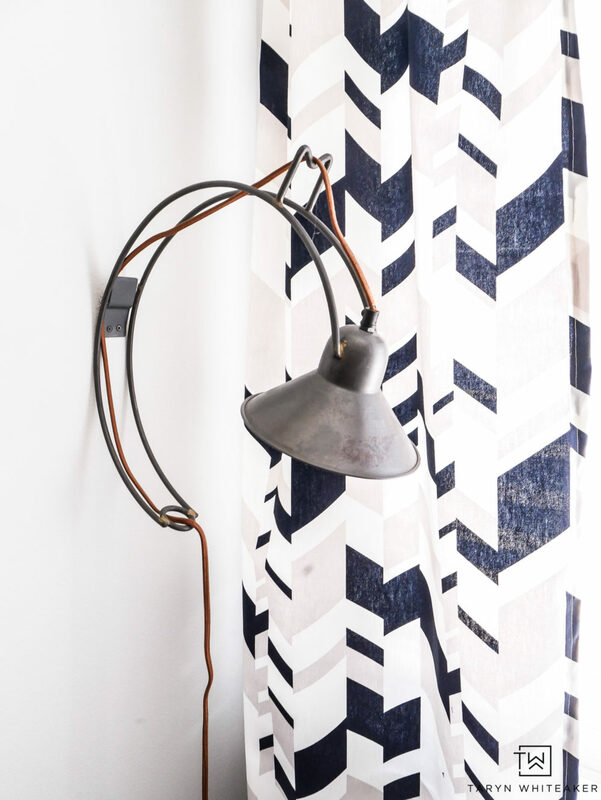 I took the rustic valence down from the previous design and added these more modern geometric curtains. I found the fabric and ended up making them myself. Like most of my designs, I like to added a little geometric pattern around to give it an updated look. I kept the same mirror and hook combo for this wall, but updated them to a more modern round mirror and black hooks. And those prints you see in the mirror I created a few months back and can be downloaded here! When we sold the crib, we had to sell the small dresser/changing table that went with it so it was time for a new big boy dresser! 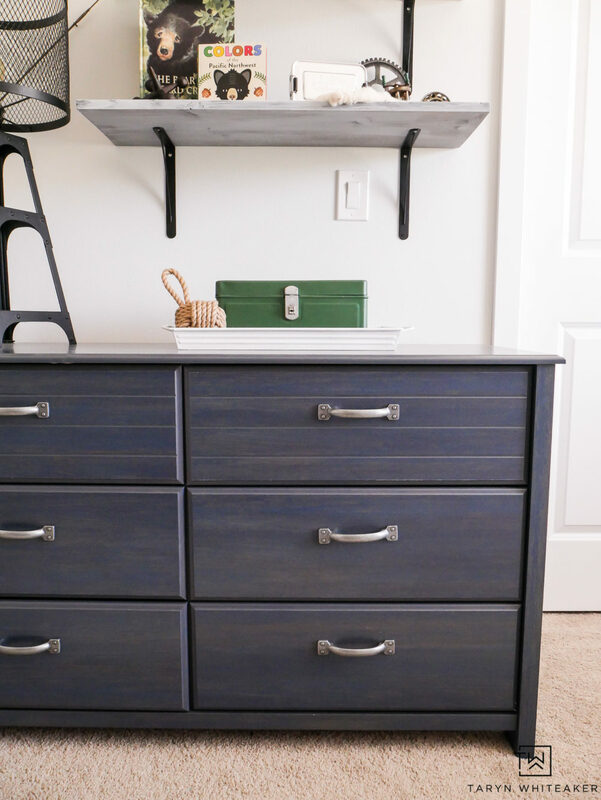 I love the color of this blue 6 drawer dresser and the subtle wood grain to the finish. It’s a pretty blue color with antique metal pulls. This piece is super sturdy too! It took me about 1.5 hours to put together by myself. It really wasn’t that bad to assemble and the directions were great. 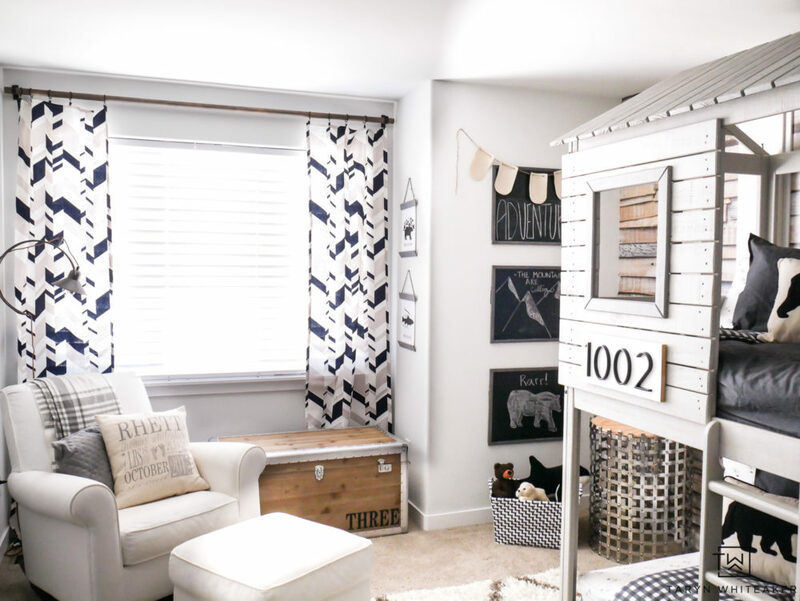 I wanted to add some shelves to this room so Rhett could have a place to put special things as he gets older and more into activities. I added these DIY shelves above the dresser. They only took me about an hour to make and now he has a place to display special books and keepsakes. I also added a little chalkboard art station in his room. I thought it would be fun to have a space for drawing and playing and creating his own art. I took three chalkboards and painted the trim gray and then hung them on the wall! 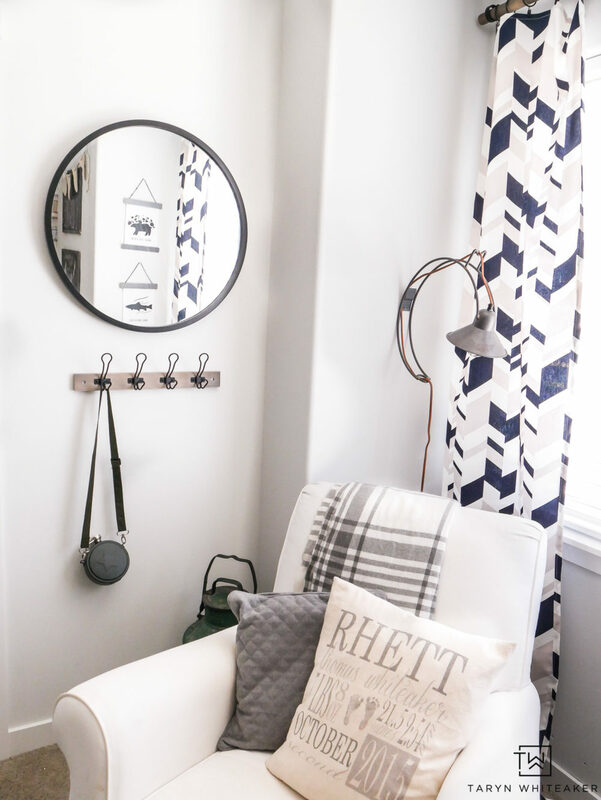 I am so happy with how this entire room turned out and so is Rhett! Huge thanks to Overstock for making it happen! Get the full list of sources here! Can you tell me where you got the curtains?!?! Can I get the link to the fabric too? This room turned out so good! Is this the same rug from the nursery? The colors look different. If not, where is it from? Thanks! I really really love how the room turned out – now it’s a very cute + cozy bohemian wildlife boys’ cave. I would attach a little teepee as a reading nook. 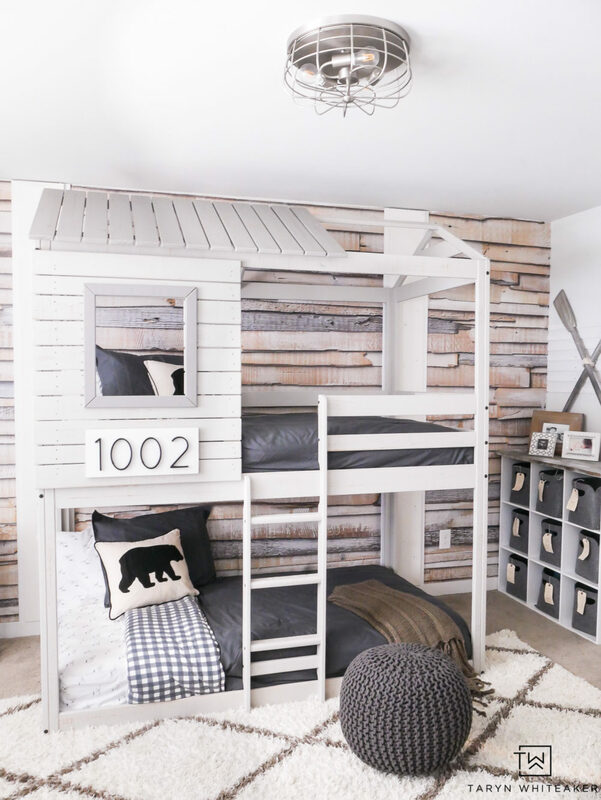 Adorable room! If my boys were little again, I’d copy it exactly. It’s Soo cute. And Rhett is a cutie, too.